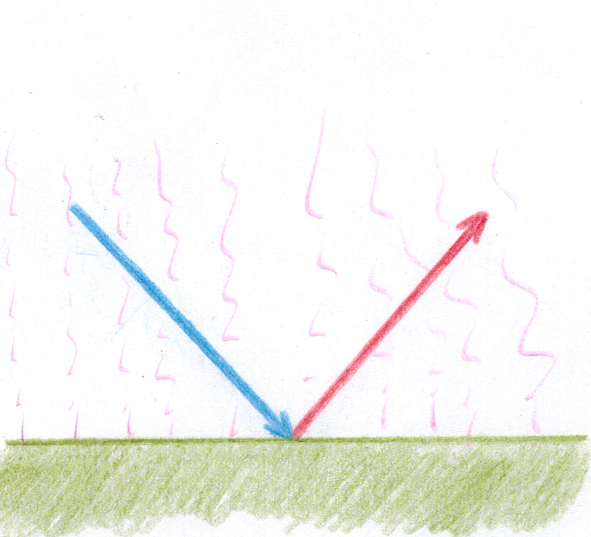 Mechanical waves are the product of a perturbation of a medium caused very often by a vibration. What is characteristic of the different types of mechanical waves is that their propagation does not involve a real displacement of the particles of the medium. The particles just oscillate a bit around their initial position, returning to the starting point as the energy goes away. That means that mechanical waves' propagation involves a displacement of energy and not a displacement of the substance of the medium where they propagate. Mechanical waves always propagate in the same way, no matter what the density of the medium in which they propagate is, being the speed of propagation the only exception: the denser the medium is the faster they propagate. 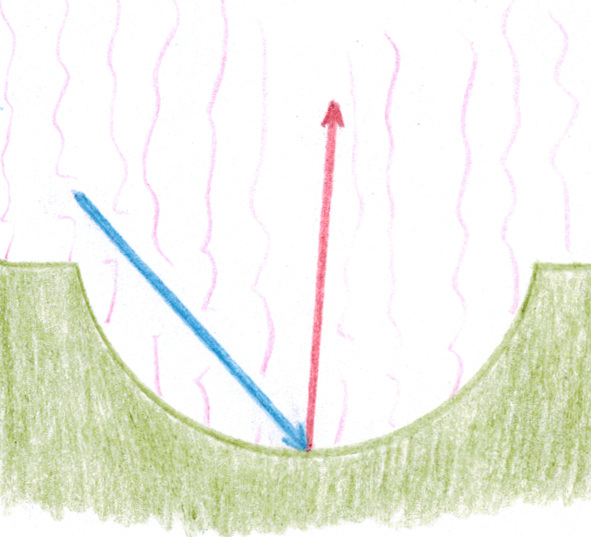 At 20ºC, sound will propagate in the air at 343 m/s, in water at 1484 m/s, and in brass at 4700 m/s. From the point where the initial vibration occurs mechanical waves will propagate in all directions, loosing intensity with the distance until the energy dissipates. That's why we see rings on the water when rain or whatever object falls in it. That happens in 3D, not only in 2D: as long as no surfaces were encountered, if we could see sound propagating through the air we would see spheres growing bigger instead of the rings we can see on water. Surfaces are boundaries, a change of the density of the medium where propagation occurs: from a solid material into gas, or from gas into a solid material, or from gas into liquid, or from a denser liquid into a less dense liquid, or from one solid into another solid, etc. 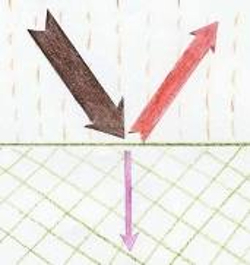 When mechanical waves find a surface in their propagation, a part of the waves will rebound on it –the “echo” effect– and another part will get refracted into it, crossing the surface and entering the new medium. the more distant those densities are the more waves will be reflected on the surface and less will be refracted. 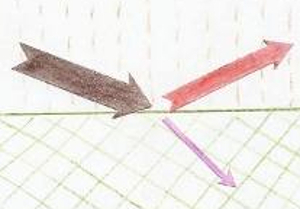 The angle of incidence of the wave on a surface is also important: with the same densities the more perpendicular to a surface the trajectory of the waves is, the more waves will cross the surface, and the more oblique the trajectory is, the more waves will be reflected on it. 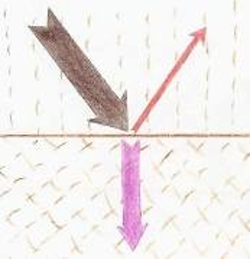 Depending on the shape of the surface where waves will reflect on it will happen in different ways. 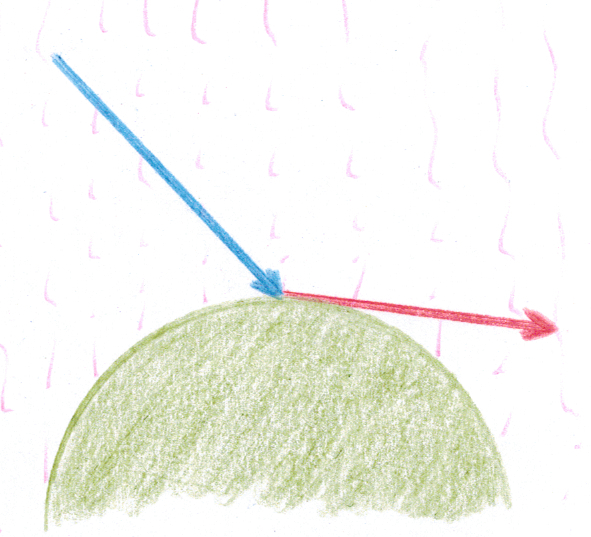 On a straight surface the angle of reflection is the same as the angle of incidence. 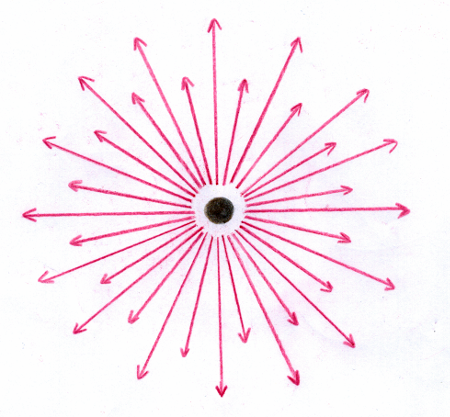 A convex surface opens the angle of reflection, and a concave one closes it. Rough surfaces reflect waves in many directions. Opening straight lines are a very useful shape when you want to send waves along the direction in which the straight lines open. 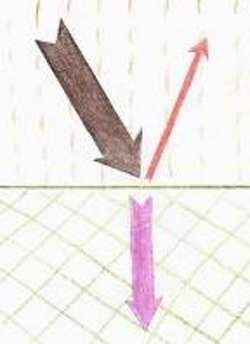 Even waves initially going in a trajectory totally perpendicular to the direction of the opening straight lines change to that direction in a few reflections on those lines. This shape or variations of it with more or less straight or more or less curved opening lines are present in bridges, in blades of old string instruments and maybe also in old reeds. A little note about frequencies: mechanical waves lose intensity with the distance and when encountering surfaces, being the trebles the range of frequencies suffering the most. Think of a concert of pop or rock music you are going to: as you get closer you'll be able to hear more and more instruments. From afar, you won't hear anything but the bass. The shorter and less disturbed the way of mechanical waves is, the clearer will be the sound you hear. The longer and more disturbed that way is, the darker will be that sound.